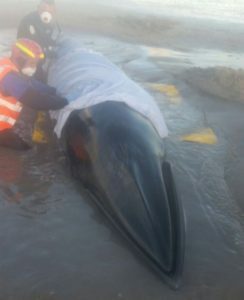 Rescue attempts to save a whale stranded on a Fife beach appear to have been successful. Volunteers who refloated the 20-foot minke at Elie are hopeful it has now made its way back to deeper waters. The whale was spotted on the beach west of Elie at 4pm yesterday. A team from British Divers Marine Life Rescue led the operation to refloat the mammal at high tide. An initial attempt failed when the whale re-beached itself but a second attempt was made later in the evening. A spokeswoman for the rescue organisation said, “One of the rescue team from last night has been out and walked the coastline where the whale was refloated from last night and there is no sign of it. The whale is thought to have been in good condition and uninjured.